The Mosaic project identifies, gathers, harmonizes, and distributes surviving historical census microdata for Europe and beyond. It aims at building a comprehensive and detailed resource for the historic study of populations by historians, demographers, economists, and other researchers (www.censusmosaic.org/cgi-bin/index.plx). The Mosaic project builds on historical integrated census microdata projects such as the Integrated Public Use Microdata Series (IPUMS) and the North Atlantic Population Project (NAPP). Records are distributed in the same integrated format, so that historical comparisons can be made across time and space. Data for the Mosaic project is provided by its partners, which include an international set of institutions in Europe and beyond. The HSN is partner for the Netherlands and performed two projects for the Mosaic project. 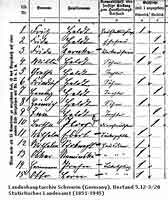 The first one was a systematic survey of the survival and availability of census forms and census-like documents in the Netherlands from before 1850. In May 2012 this first project was completed with the delivery of the report Sanne Muurling and Kees Mandemakers, MOSAIC Census Inventory of the Netherlands - Final report. The second project was directed at the data entry of censuses from the provinces of Zeeland and Noord-Brabant from the period 1810-1811. Starting point were already existing but incomplete datasets, entered by genealogists or researchers. All datasets were compared with the original forms, completed, improved and systematized. The datasets can be downloaded from this site, see below. In future a more enriched version will be disposed from the Mosaic website.